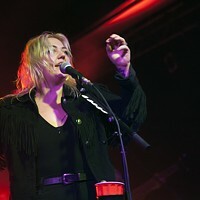 Two-time Grammy nominee Elle King burst onto the national music scene just over a year ago with her debut album, Love Stuff. Her top-10 single, "Ex's & Oh's" earned her the Grammy noms while the fiery attitude and infectious tempo of her second single, "America's Sweetheart," landed her on plenty of late night shows and radio dials across the land. She's been able to quickly make a name for herself relying on her talent instead of her Los Angeles lineage (her father is comedian Rob Schneider; her mom is former model Landon King) — which is refreshing, and probably the way most children of stars should tackle their art in the first place. She credits her stepfather, musician Justin Tesa, with teaching her to play guitar and sparking her interest in music. While she works on writing for her second album, she continues to tour for her debut, including a stop at Amos' Southend on April 11. If you've seen any of her television appearances, you get the quick impression that not only does King love what she does for a living, she doesn't hesitate to change up the cadence of her vocals or add spirited emphasis to some of her lyrics. She taught herself to play banjo, has more than 35 tattoos and her chipped front tooth is the result of getting a bit too close to a microphone. All in all, she lets her music do the talking — and that music is a damned good blend of rock, country and blues. King, 26, has been battling vocal issues while on a recent tour of Australia, so we were unable to schedule an interview. Instead, we thought we'd get some answers out of her honest lyrics which usually focus on relationships, with some splashes of whiskey thrown in. I know you recently got engaged to your longtime boyfriend, but your songs don't hesitate to throw shade on your exes. Do you ever hear from them? "Ex's and the oh's they haunt me. Like ghosts, they want me... They won't let go." You must have had some kind of power over them. "Well, I had me a boy, turned him into a man. I showed him all the things that he didn't understand... then I let him go. Now, there's one in California who's been cursing my name 'cause I found me a better love in the U.K. ... until I made my getaway. I had a summer lover down in New Orleans — kept him warm in the winter, left him frozen in the spring." Sounds like there's some cold emotions in there. You never had a sense of "treat others as you'd like to be treated"? "It's a mean world that I've known. Never got no good doing what I'm told. Now you'll find me where the devil don't go." It's almost like you want to see how the other half lives. "It's good to be a man these days — don't have no conscience about my evil ways; don't ever feel bad for the awful things I say. To be a man would be serene — drinking beer til I get mean, chewing tobacco, kissing girls like life's a dream. I bet it gets tiring always having to be right. My only worry would be my receding hairline." So, would you consider yourself some kind of role model or inspiration? "What do you want from me? I'm not America's sweetheart. They said I'm too loud for this town, so I lit a match and burned it down." Well, that's a serious bit of sass and attitude you're putting forth. "I warned you before. Well I, I coulda sworn I told you I was mean." Your lyrics exude a certain level of confidence. Where does that come from? "There ain't nothing that I gotta prove. I think I'm pretty with these old boots on. I think it's funny when I drink too much. I don't want to be nobody else. I like the chip I got in my front teeth and I got bad tattoos you won't believe. They said I'll never be the poster type, but they don't make posters of my kind of life."